Presented by: The Greater Towson Committee, Inc. The final word on the language of urban planning and design. 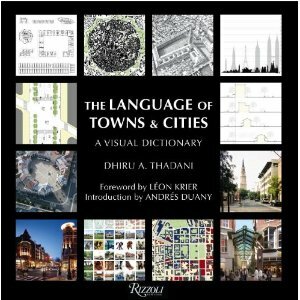 The Language of Towns and Cities is a landmark publication that clarifies the language by which we talk about urban planning and design. Everyday words such as "avenue," "boulevard," "park," and "district," as well as less commonly used words and terms such as "sustainability," "carbon-neutral," or "Bilbao Effect" are used with a great variety of meanings, causing confusion among citizens, city officials, and other decision-makers when trying to design viable neighborhoods, towns, and cities. This magnificent volume is the fruit of more than a decade of research and writing in an effort to ameliorate this situation. Abundantly illustrated with over 2,500 photographs, drawings, and charts. An essential work for architects, urban planners, students of design, and all those interested in the future of towns and cities, this is destined to become a classic in its field. Dhiru A. Thadani, AIA is a consultant, architect, urbanist, and educator who has been in practice since 1980, and has worked on projects in Asia, Europe and North and Central America. Mr. Thadani was Principal and Director of Urban Design and Town Planning at Ayers/Saint/Gross from 2002 to 2009 and Design Partner in the Thadani Hetzel Partnership from 1987 to 2002. He has maintained a diversified practice in architecture and urban design since 1981, and worked in North and Central America, Europe and Asia. His experience includes urban design, town planning, architectural design, interior design, landscape design, construction management, graphic design, and rendering. In addition, Mr. Thadani has taught at various institutions in both the undergraduate and graduate programs. Since its formation in 1993, he has been a charter member of the Congress for the New Urbanism, and was appointed to the Board in 2005. GTC is a non-profit 501 (c) (3) organization, founded in 1979, to promote investment in Towson through development and revitalization of property and infrastructure for the benefit of the greater Towson community. The organization is volunteer driven by experienced business professionals committed to the long term success of Towson.